What can 1,660 volunteers accomplish in just one morning? Cleaner, healthier streams within the upper Raritan River watershed – and less trash washing downstream to the Atlantic Ocean and posing a threat to marine life. 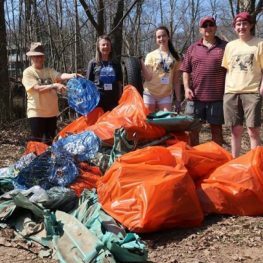 At our 28th annual Stream Cleanup on April 14, volunteers removed 13.3 tons of trash from 56 sites in Hunterdon, Somerset and Morris counties, improving more than 76 miles of stream. The most common items picked up were plastics, a growing area of concern for Raritan Headwaters and other conservation groups. Volunteers collected 7,208 plastic bottles and 2,370 plastic shopping bags, which were recycled. Large pieces of plastic, especially bags, are often mistaken for food by fish, turtles, dolphins, whales and other marine creatures. Ingesting bags can be fatal to these animals. But smaller particles of plastic, known as microplastics, can be harmful as well. The state of New York is currently considering a ban on plastic bags, which could have a significant impact on plastic pollution in the Hudson River and the NY-NJ Harbor Estuary. “For that reason, we’re especially grateful to our volunteers for not only improving the appearance of our river and stream banks, but improving the health and safety of downstream waters,” she added. But more can be done if we each individually choose reusable materials including refillable water bottles and shopping bags. In addition, we can cut down on plastic pollution by not using straws, cutlery and other commonly used convenient but disposable plastic products. Raritan Headwaters is conducting a study on microplastics in our watershed as part of a larger regional effort to better understand the impact of plastics in our water. Last summer, RHA staff and volunteers sampled stream water both upstream and downstream from 10 wastewater treatment plants along the South Branch. Results are currently being analyzed but analysis of the samples is showing staggering amounts of microplastics in our rivers. Of course, plastic bottles and bags aren’t the only trash removed from stream banks during the cleanup. As in previous years, volunteers found an odd assortment of dumped items … literally everything including the kitchen sink. Among the unusual items found this year were a vintage farmhouse sink, a Barbie Jeep riding toy, a cement lion’s head, a folding table, a typewriter, a shopping cart, luggage, a toilet, car bumpers and hubcaps, chairs, an empty propane tank, a cozy coupe riding toy and a manhole cover. Volunteers also pulled 101 auto tires from streams and stream banks that were recycled through various towns. The 1,660 volunteers included families, scout troops, local businesses, schools, and civic and church groups. Learn more about plastic pollution and ways you can help to combat the problem. RHA has achieved statewide impact and is a proud recipient of the 2015 and 2016 Governor’s Environmental Excellence Award. To learn more about Raritan Headwaters, please visit www.raritanheadwaters.org or call (908) 234-1852.